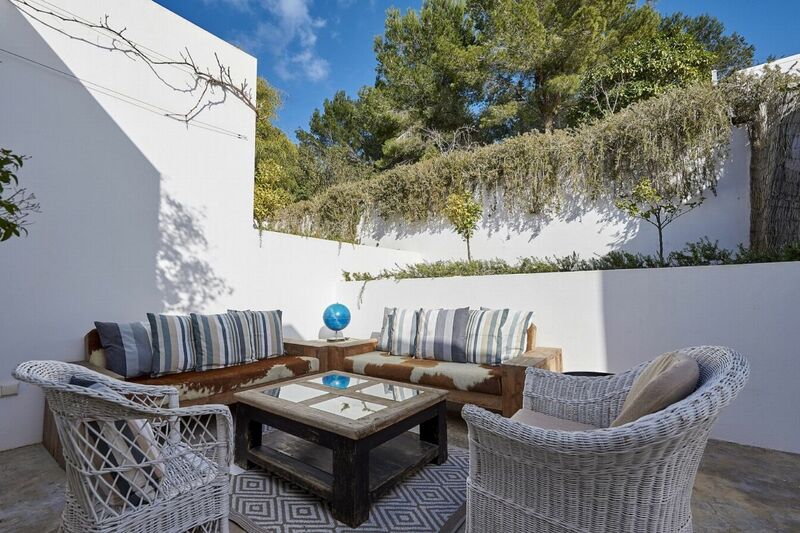 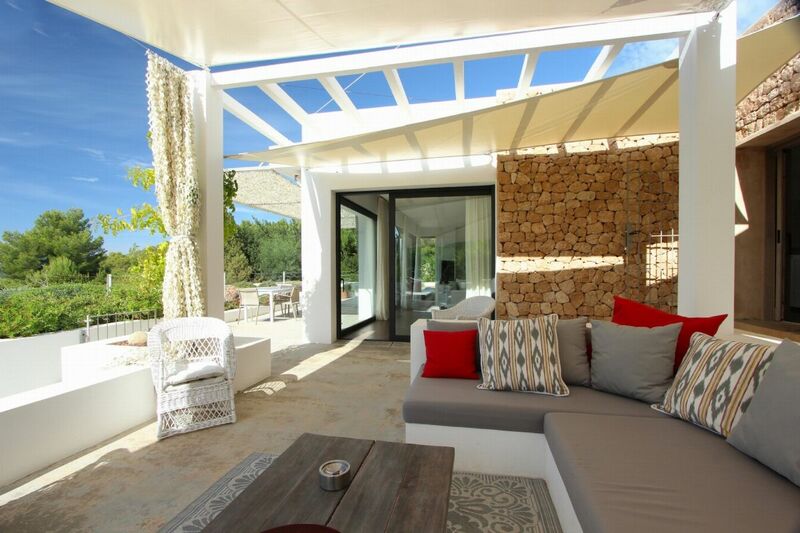 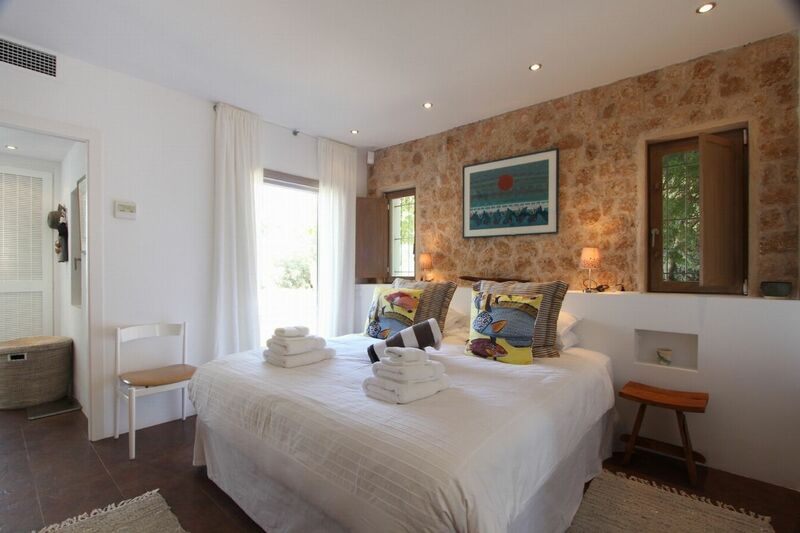 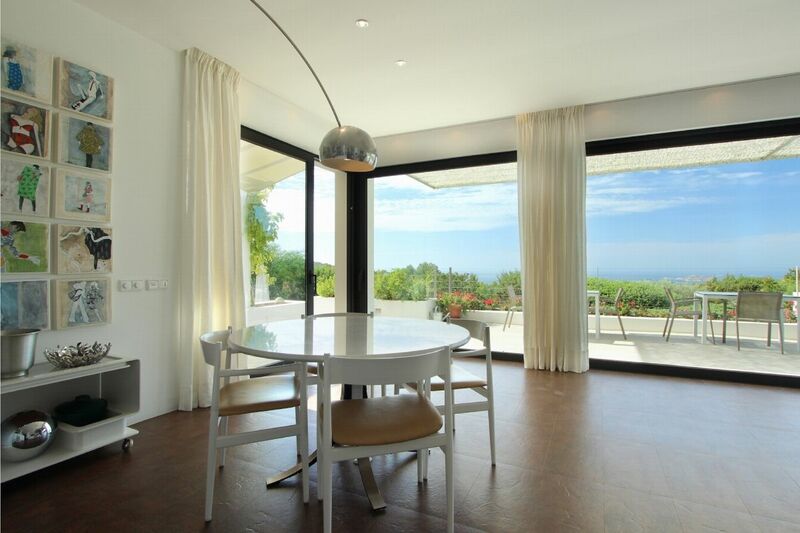 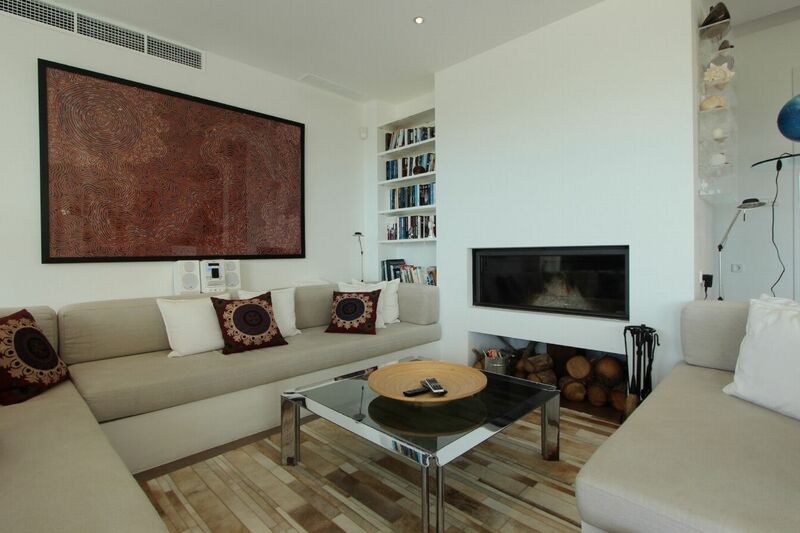 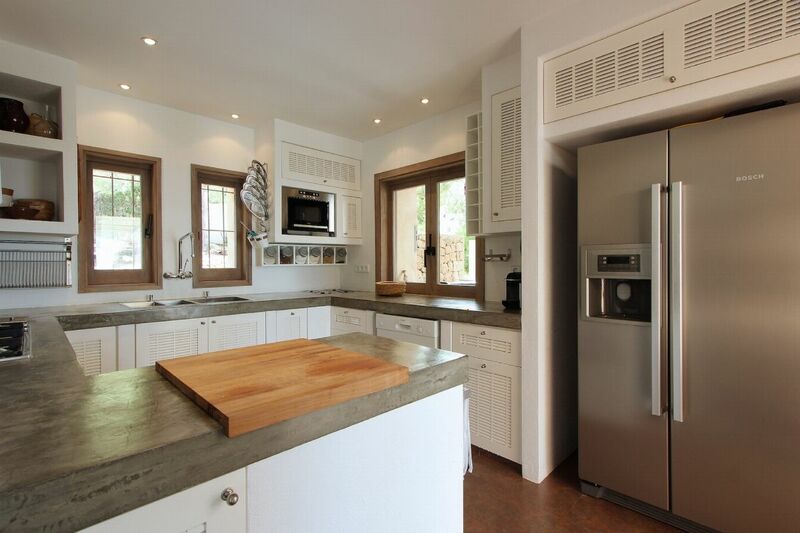 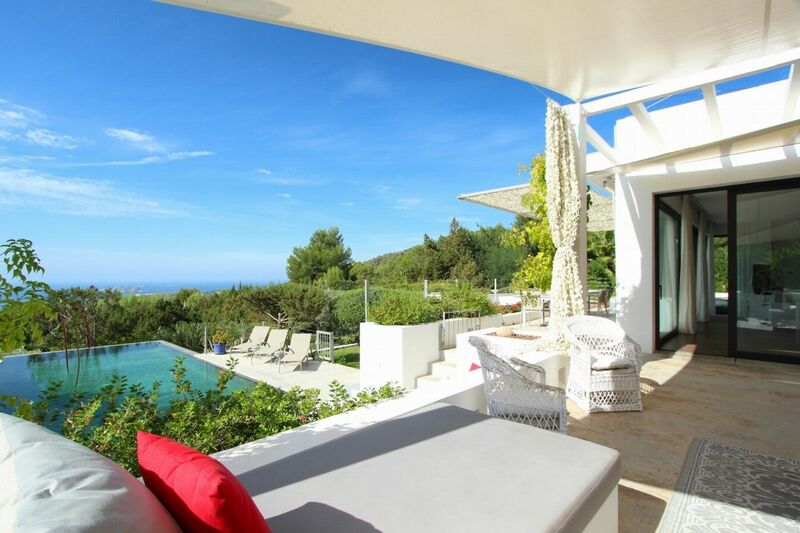 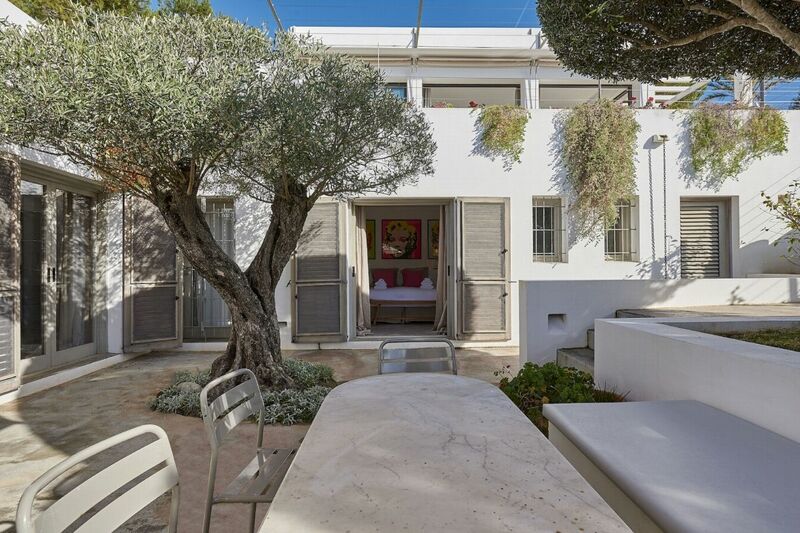 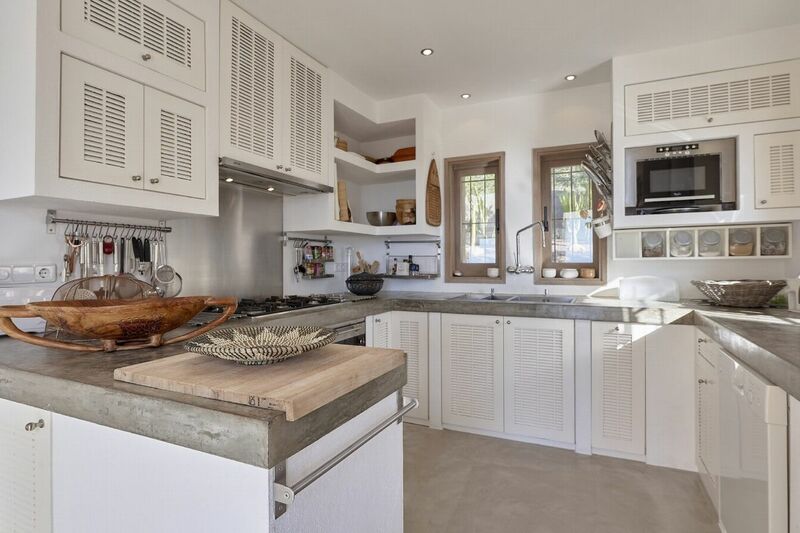 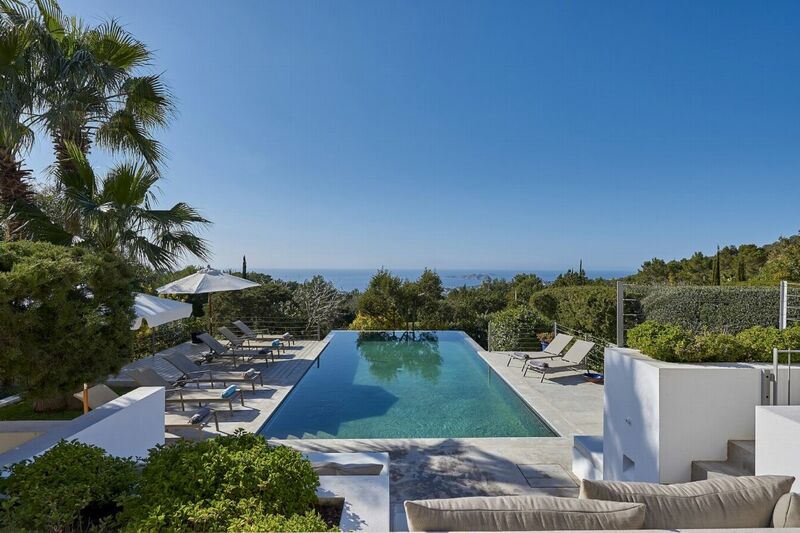 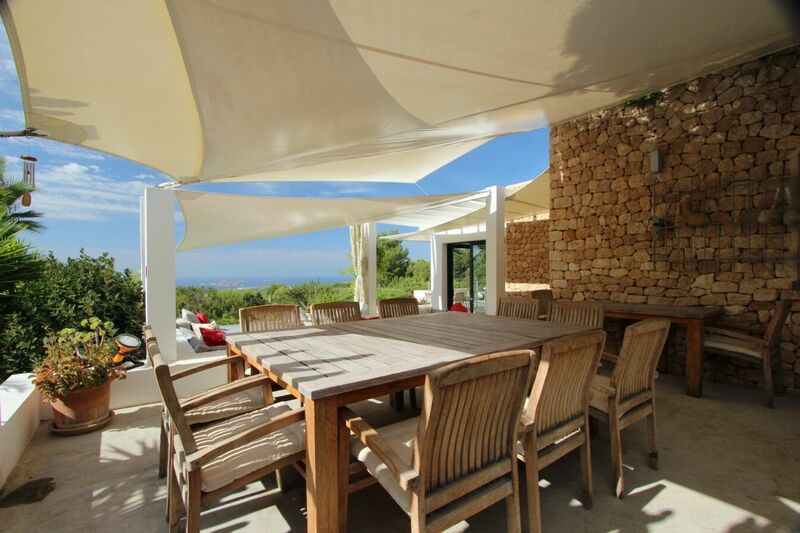 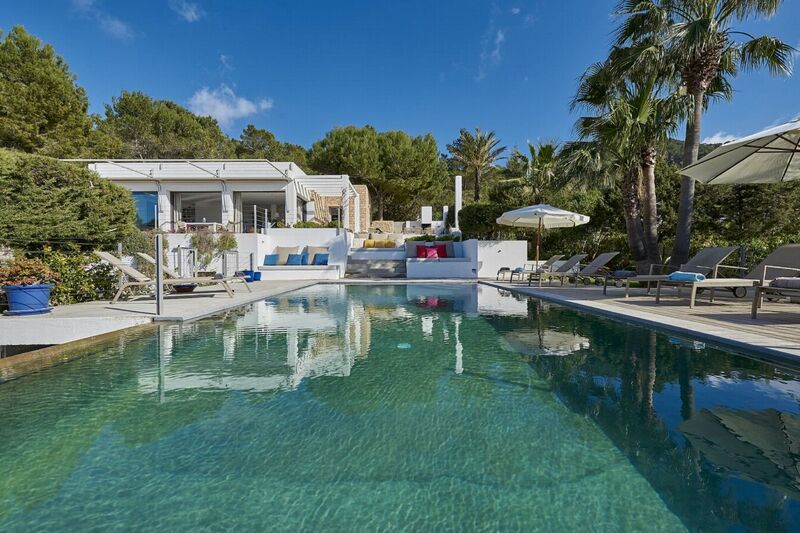 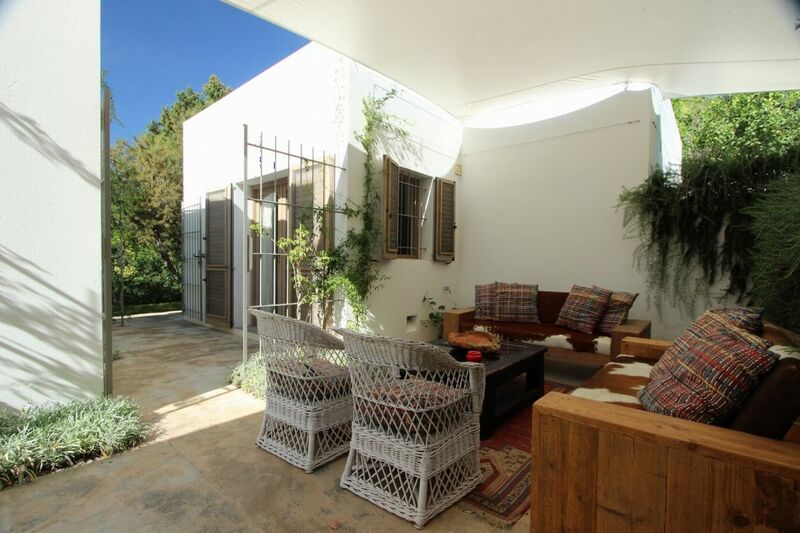 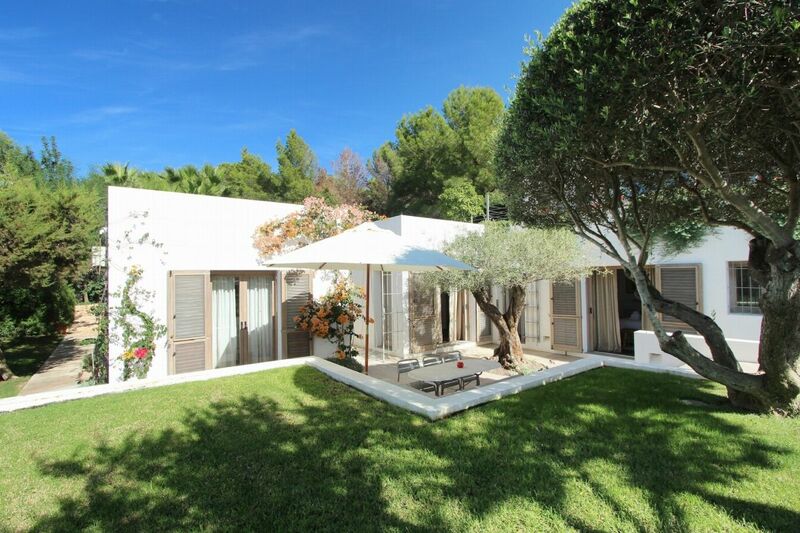 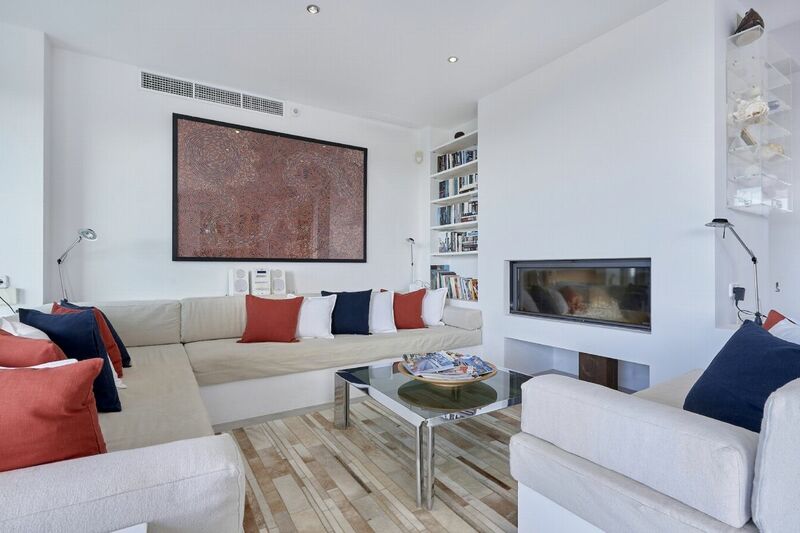 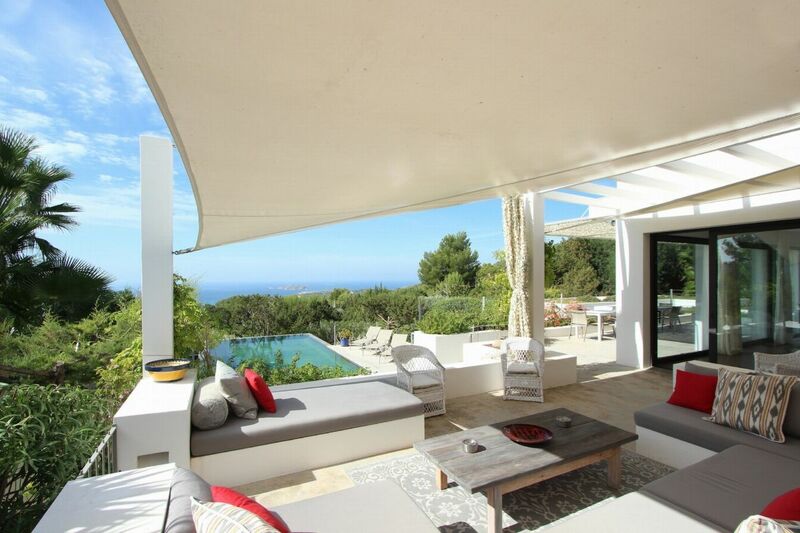 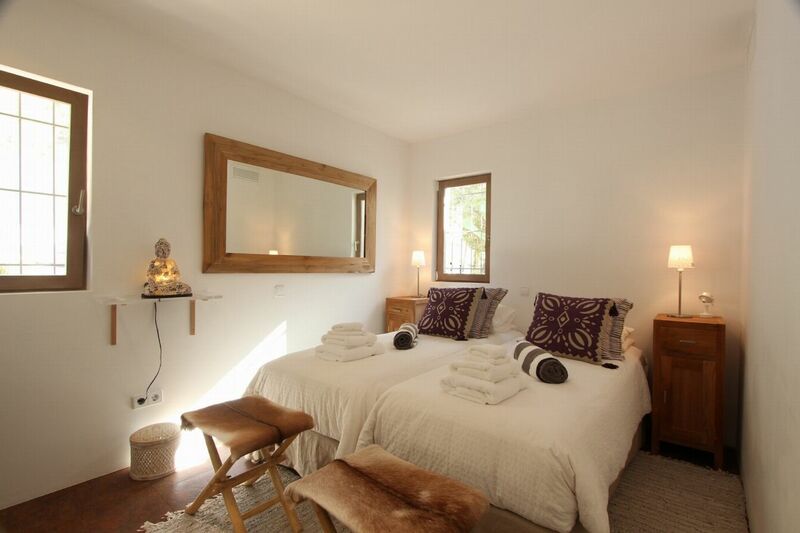 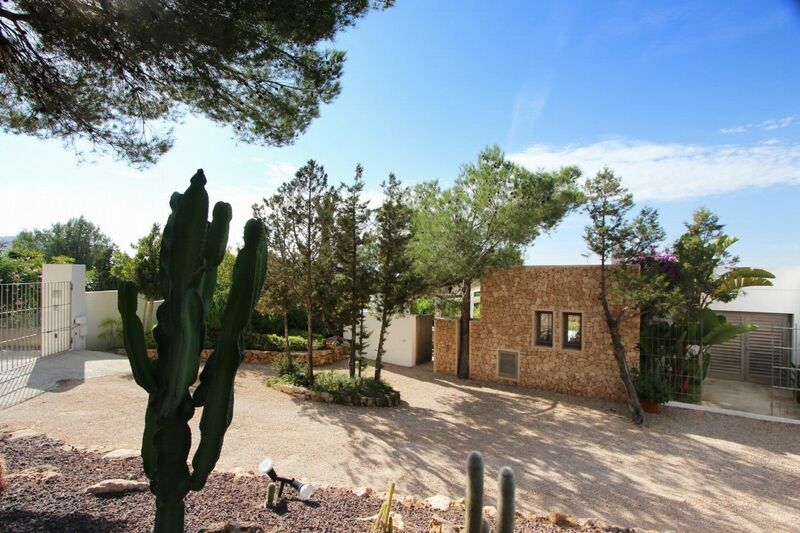 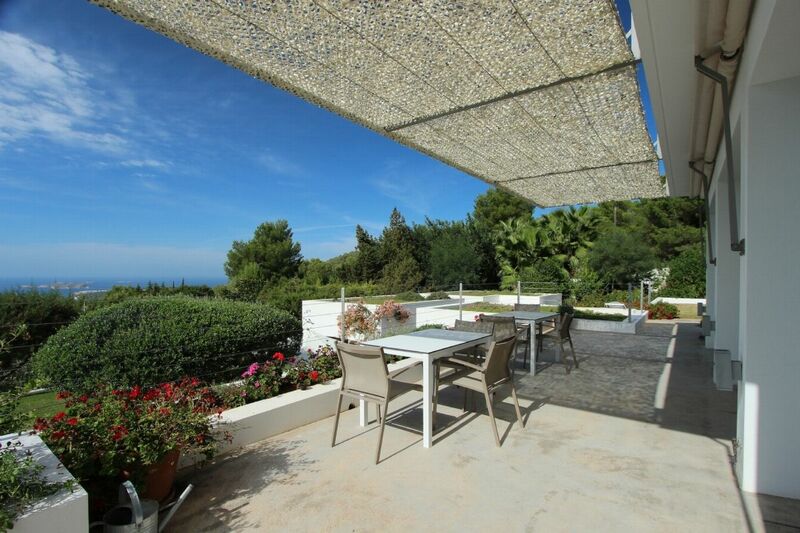 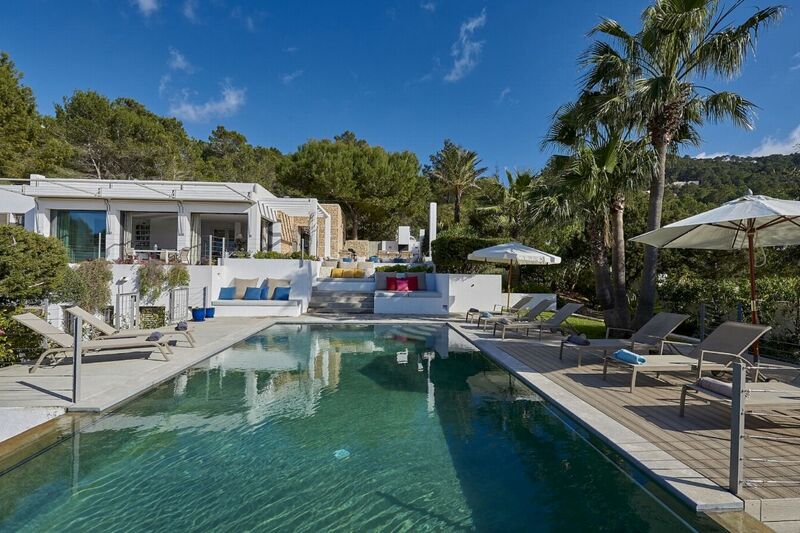 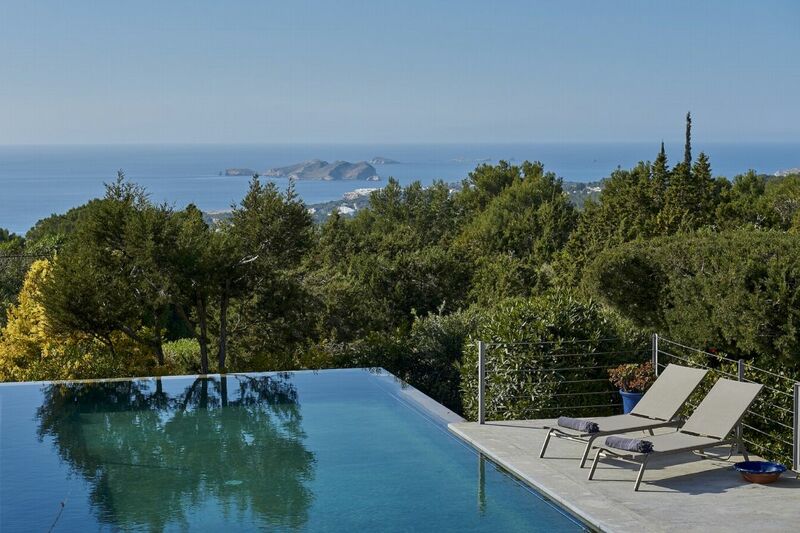 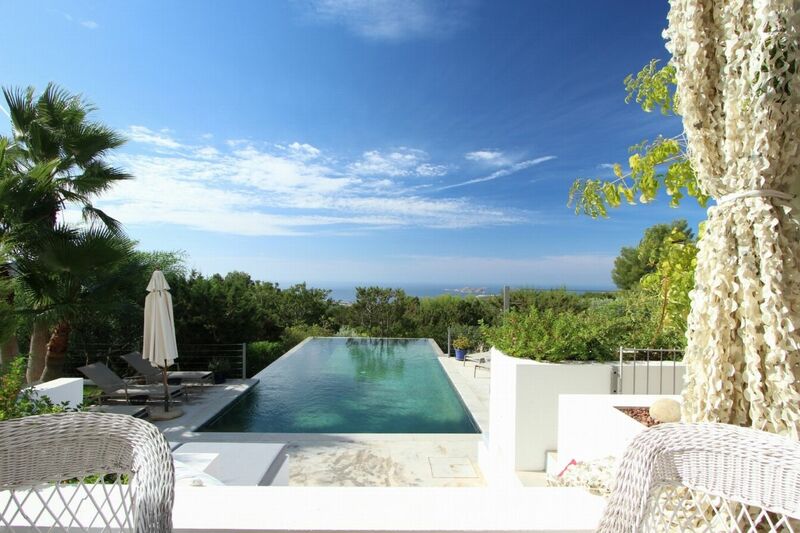 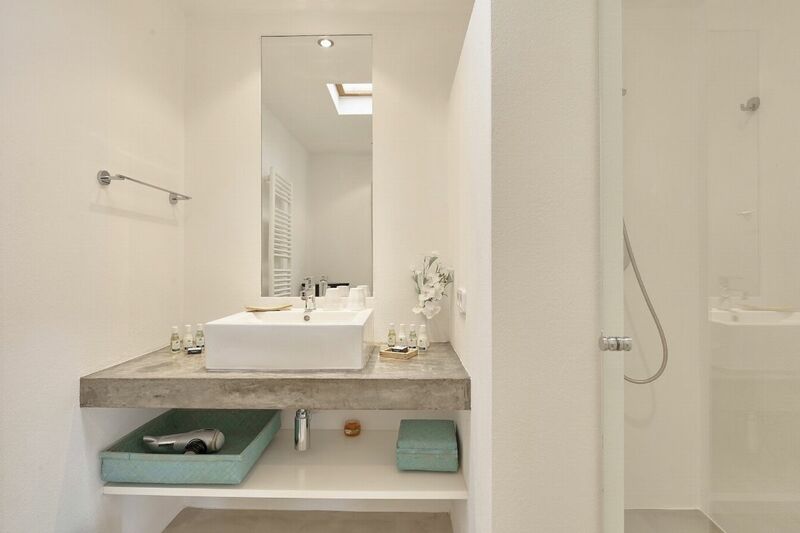 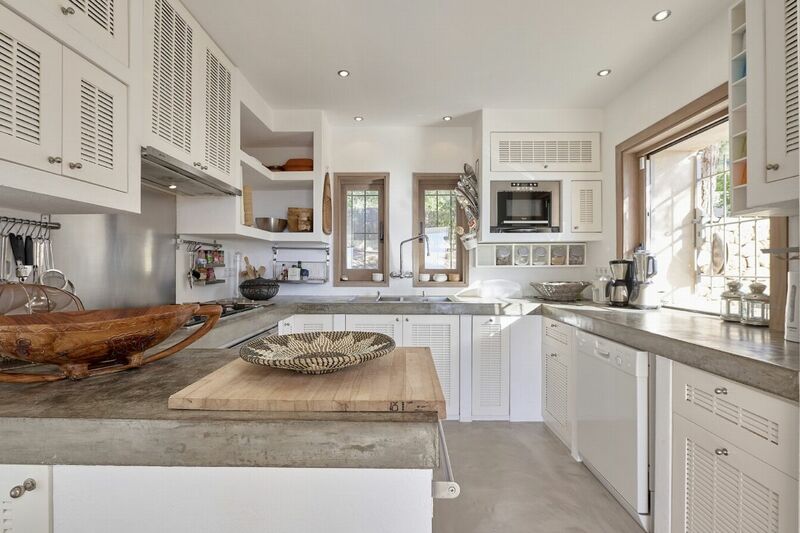 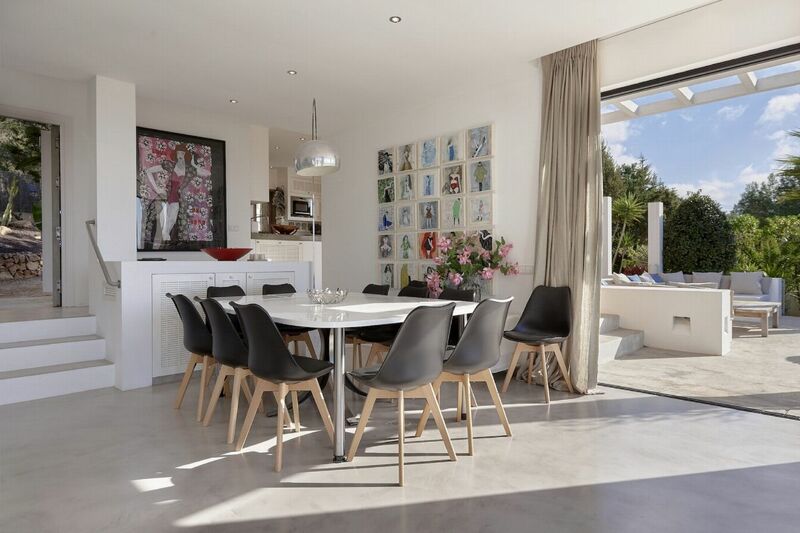 Beautiful Ibizan retreat close to the beaches of Ibizaâ€™s west coast. 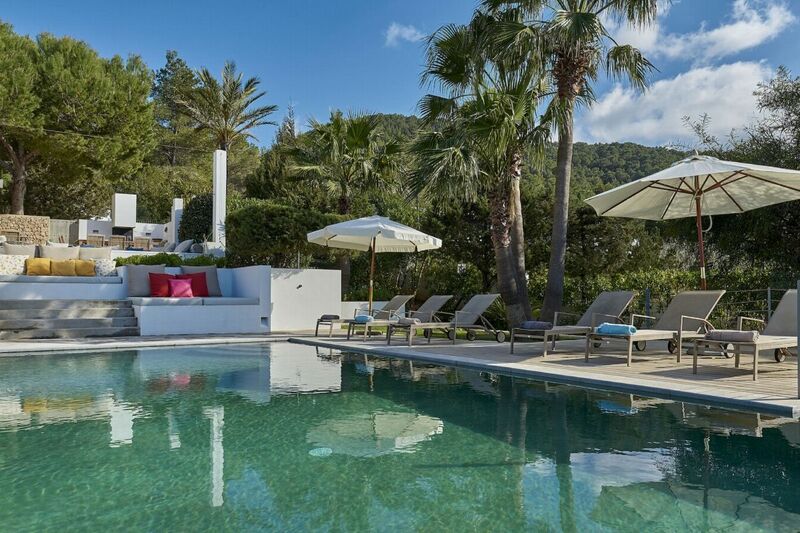 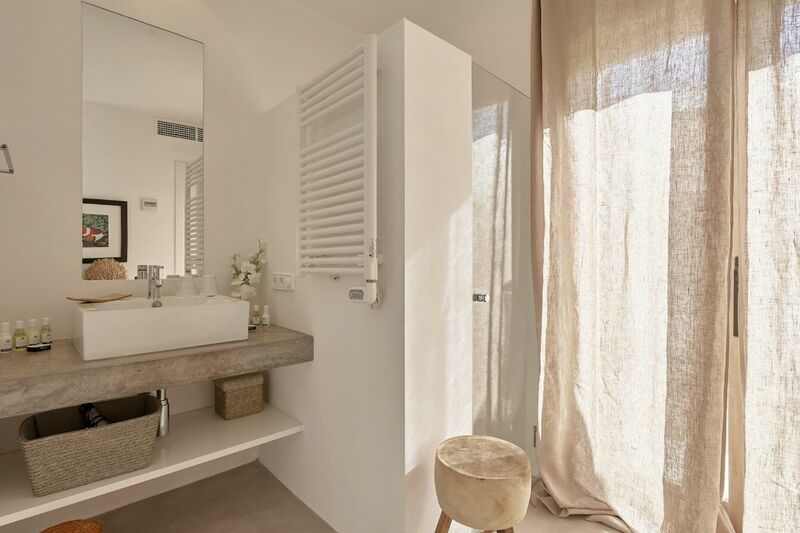 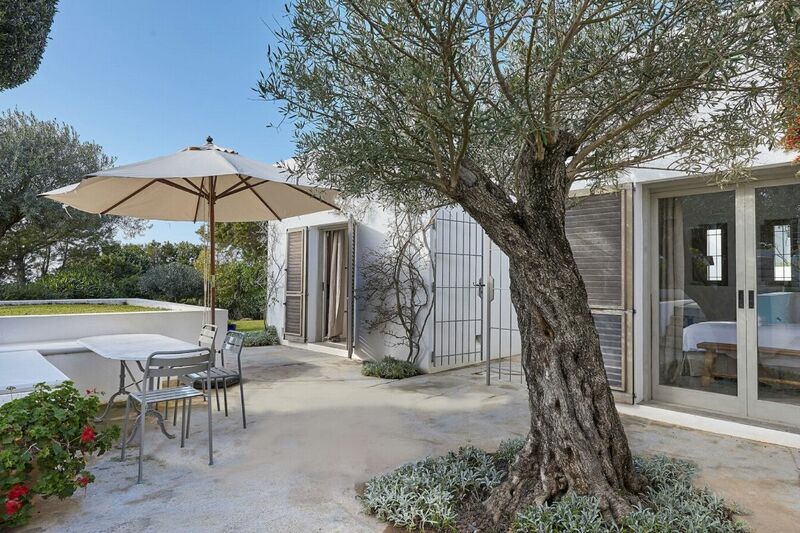 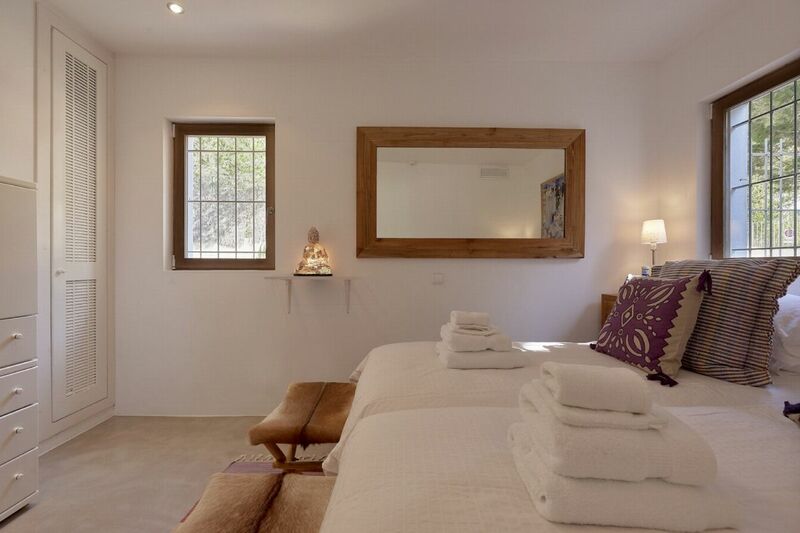 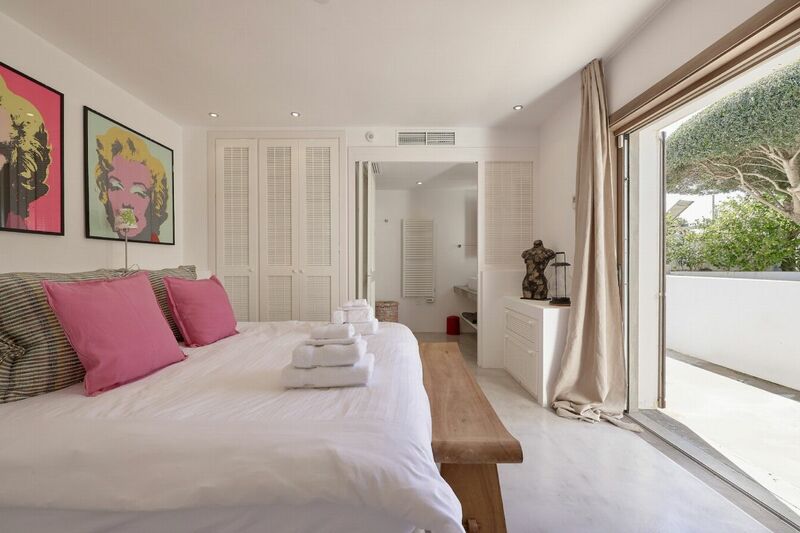 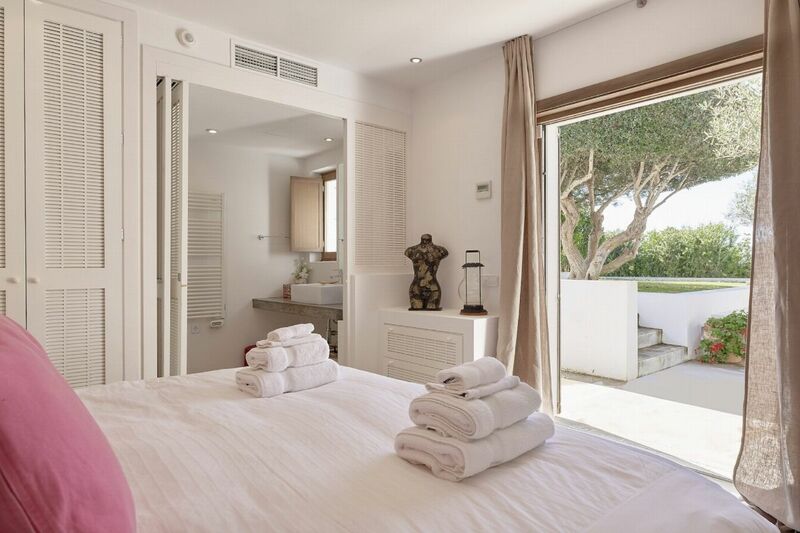 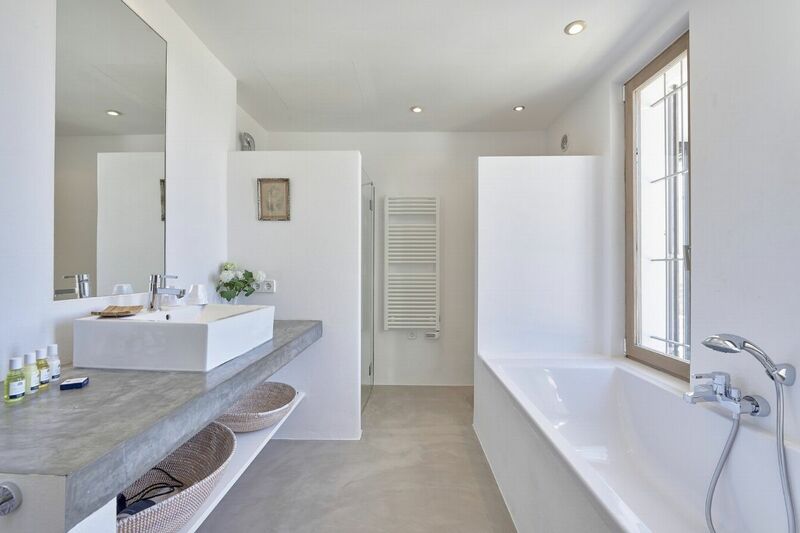 On a country road on the west side of Ibiza, just a ten-minute drive from the glorious white sand beaches of Cala Tarida and Cala Moli, Can Juana offers its guests a luxurious Ibizan escape. 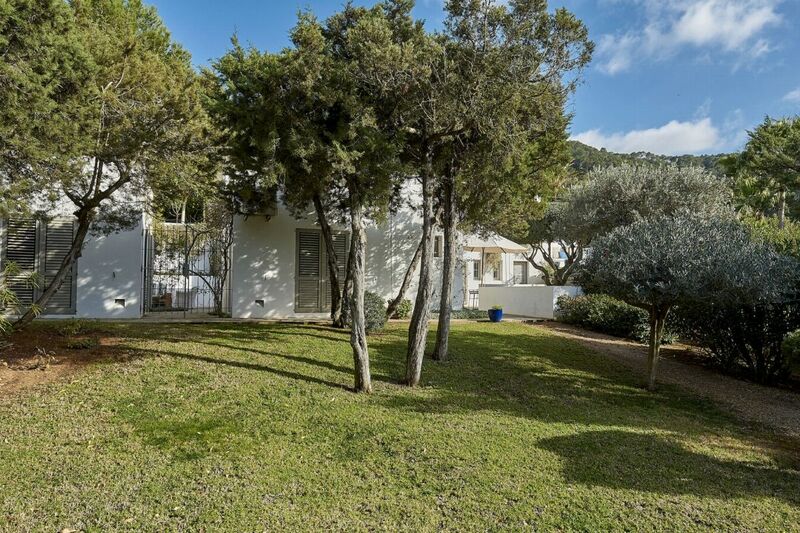 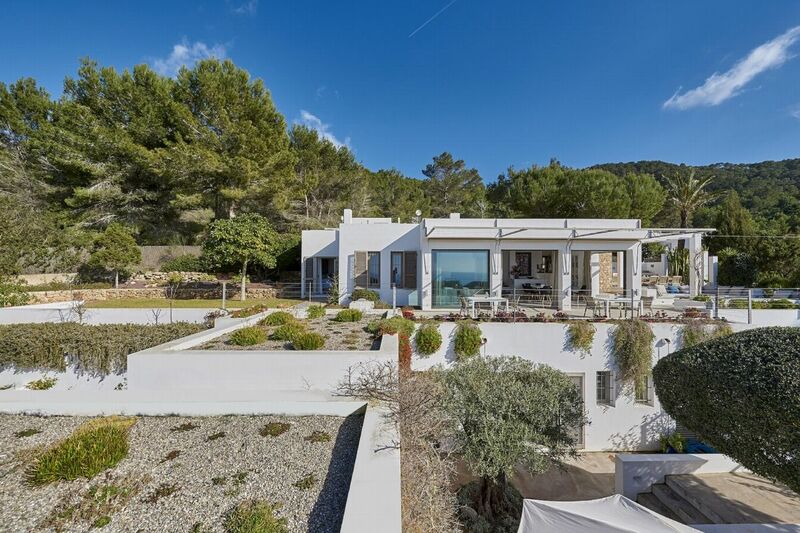 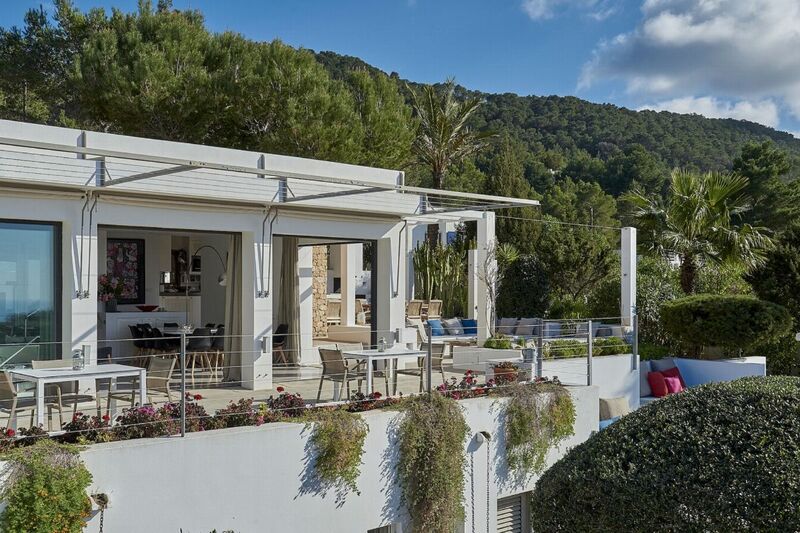 High in the pine-clad hillside above Ibizaâ€™s beautiful west coast sunset beaches, Can Juana enjoys stunning views of the sea and the surrounding hills and countryside. 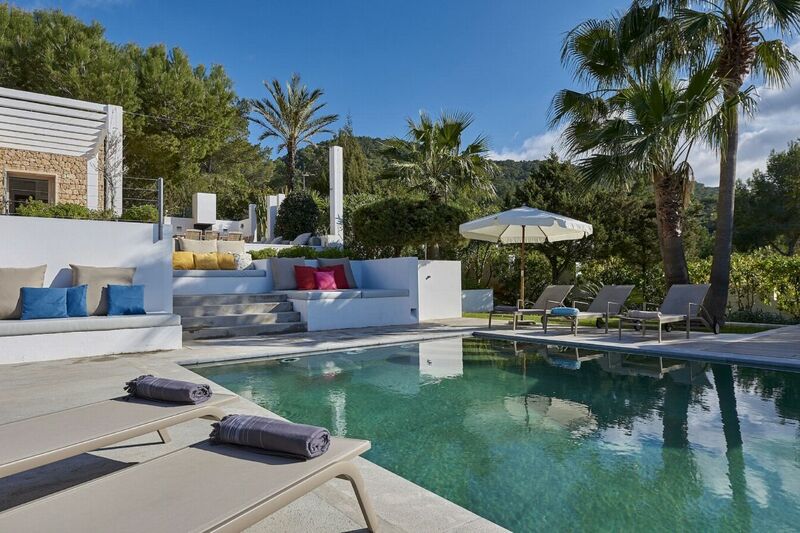 The village of San Jose is approximately a five-minute drive away and Ibiza Town is just 25 minutes by car. 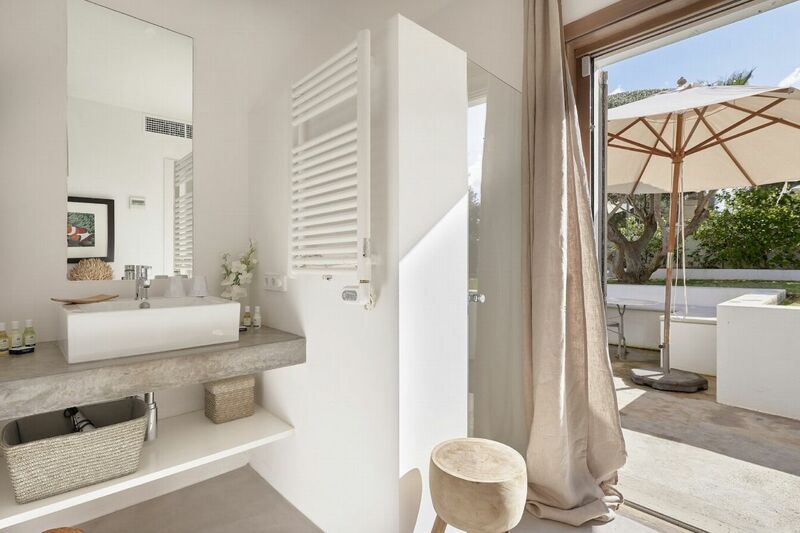 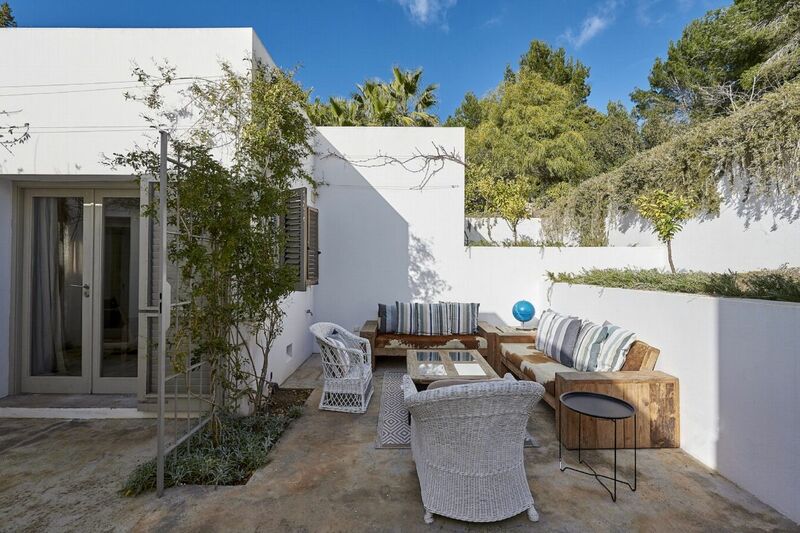 Sitting in 3,000m2 of terraced grounds, with palm trees, tropical plants and manicured lawn, Can Juanaâ€™s walkways connect the various outside spaces, from the sunny pool area to the sunset-facing alfresco dining area and the cosy garden chill-out area. 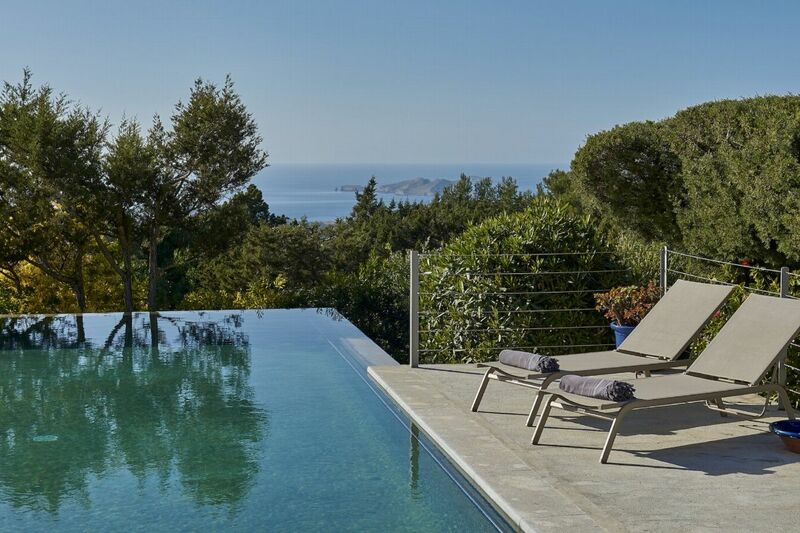 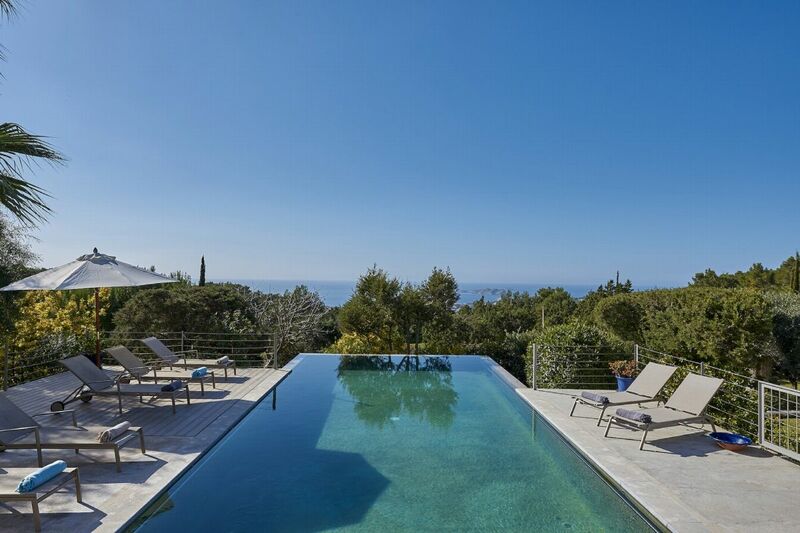 The breath-taking infinity pool seems to extend out into the treetops, with the blue Mediterranean Sea sparkling in the distance. 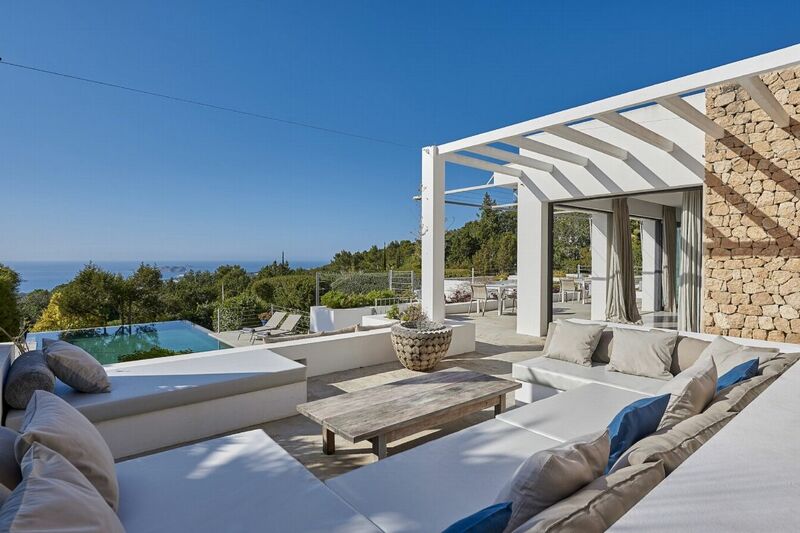 Beside the pool, a number of beautiful terraces provide opportunities to enjoy the wonderful sea view, watch the colourful Ibizan sunset, or simply kick back and relax. 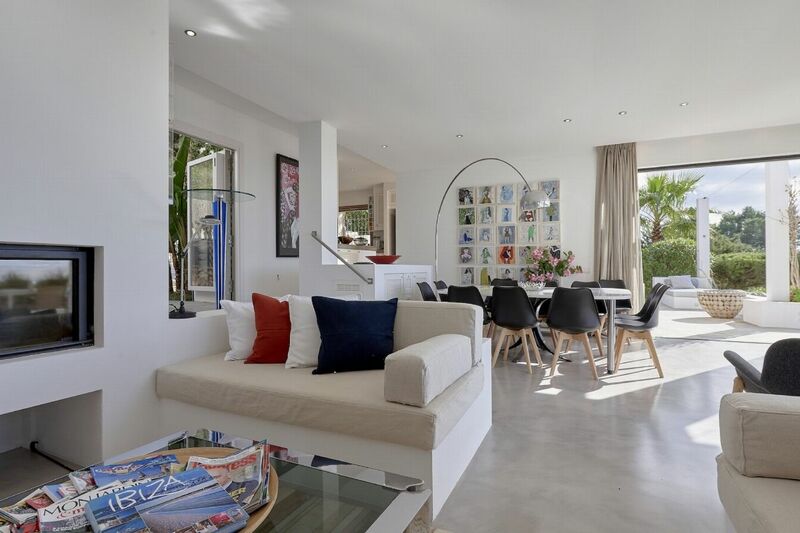 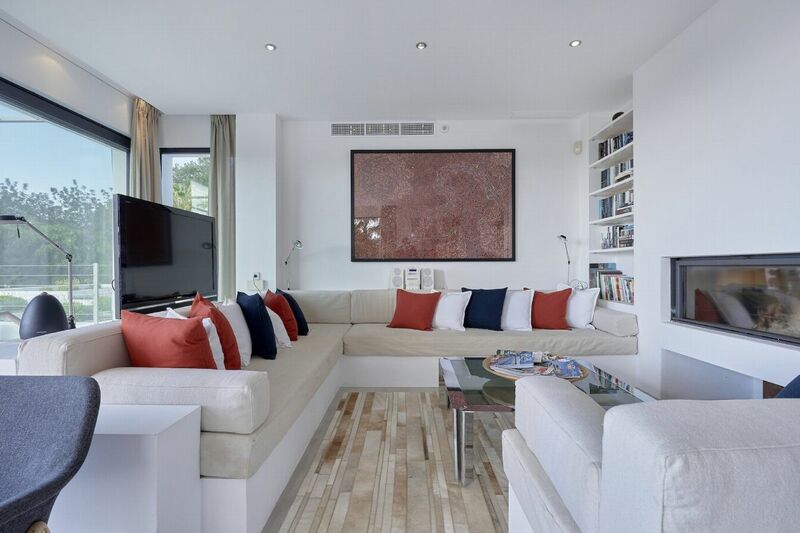 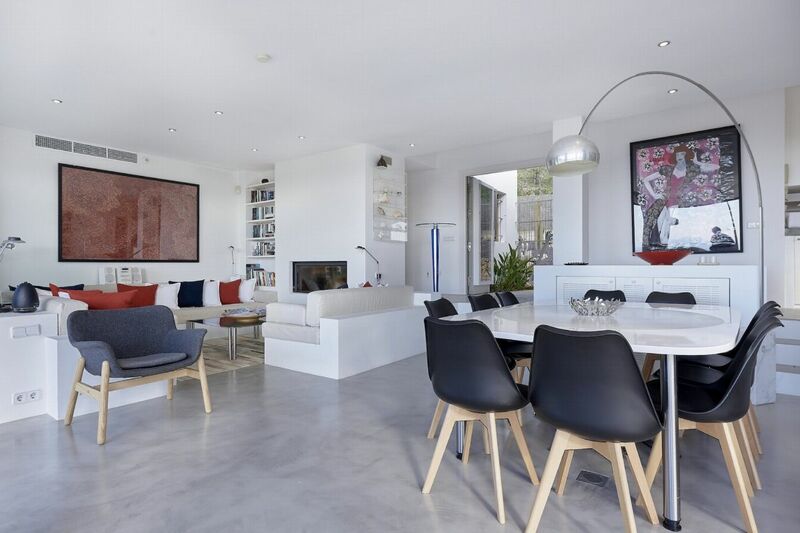 The light-filled interiors delightfully combine modern luxuries and high-tech features with calming, classic beach-house style â€“ from the cosy lounge with sofa seating around a fireplace, a light-filled breakfast room, and the polished, modern kitchen. 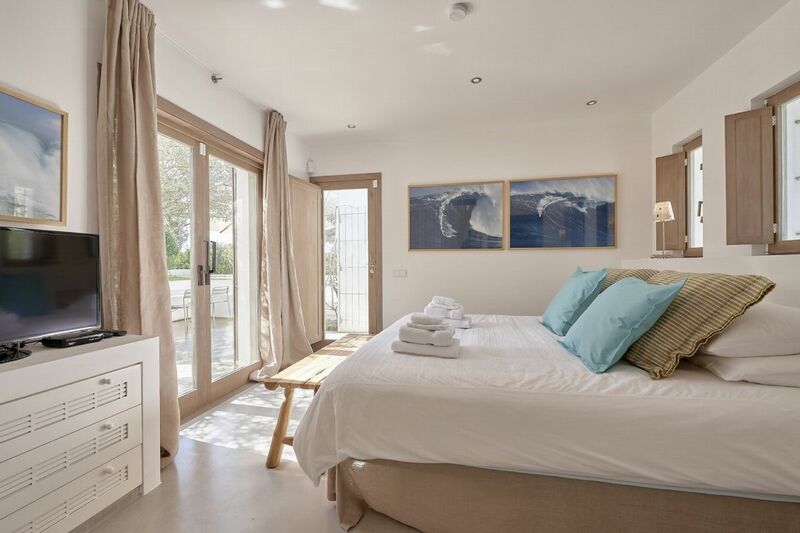 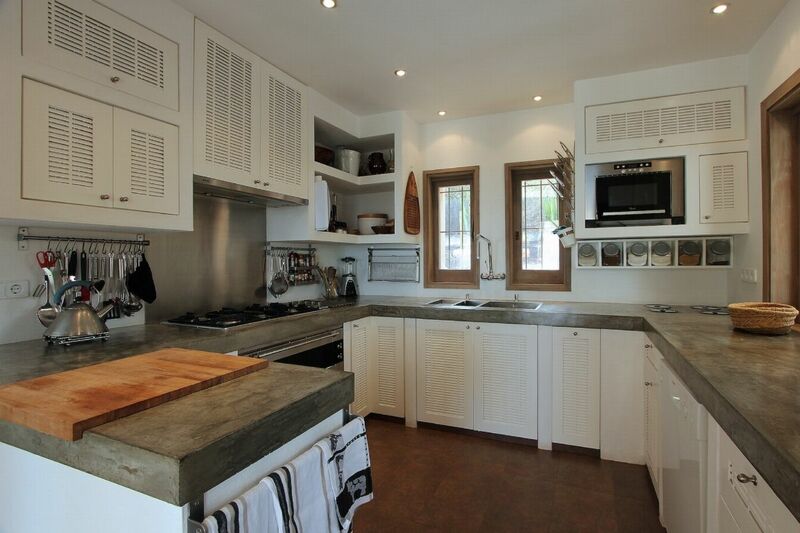 This classic beach-house style flows into the family-friendly guest accommodation. 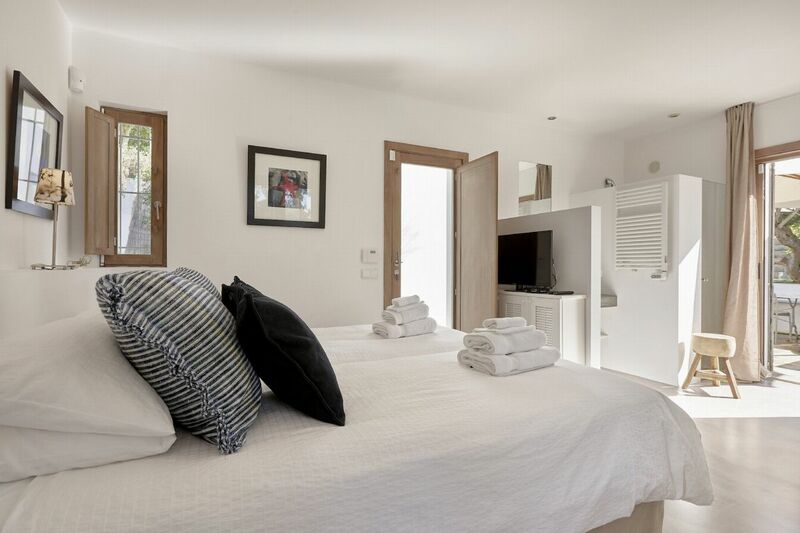 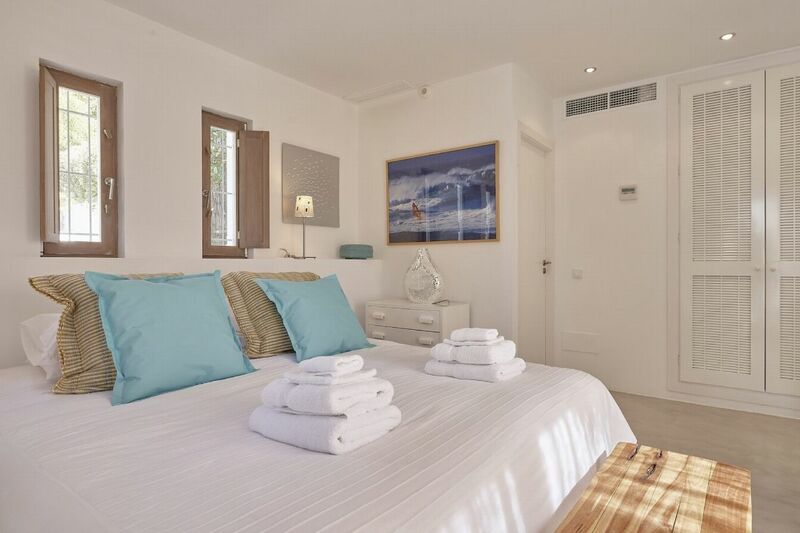 This comprises of a master suite with nearby twin, two doubles and a separate guest suite, plus a studio room in the lower courtyard â€“ offering versatile accommodation for family, friends or staff. 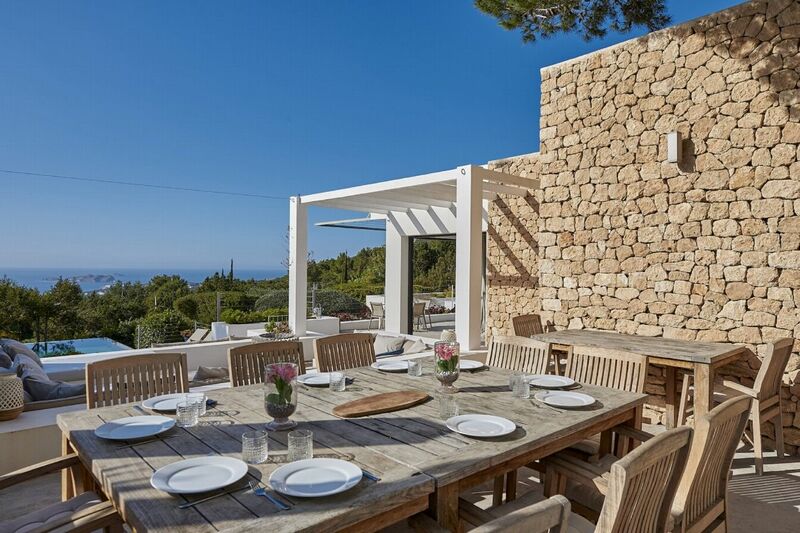 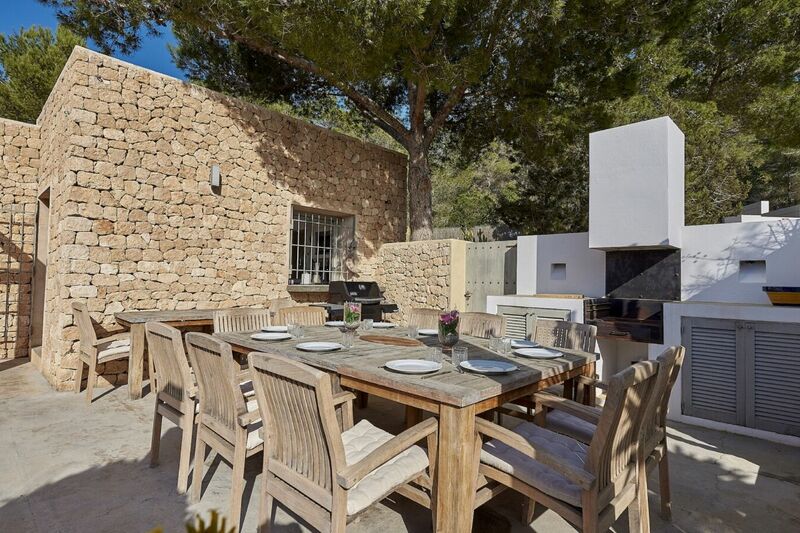 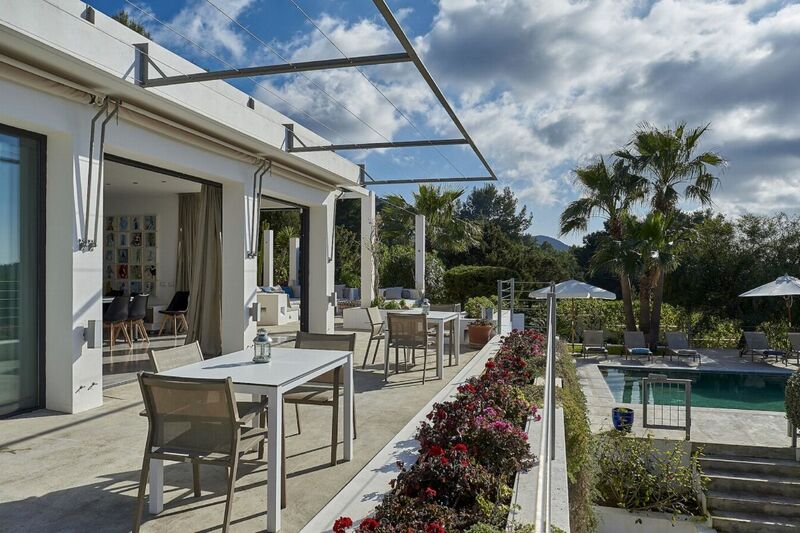 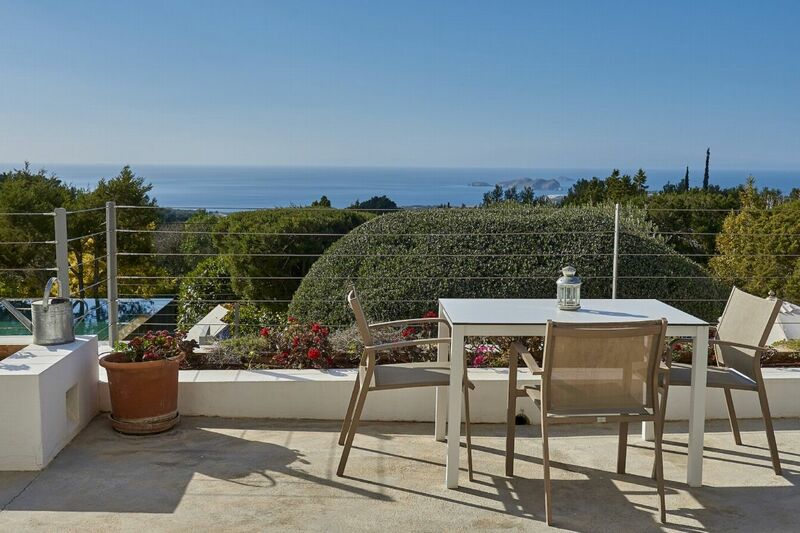 Can Juana is an ideal Ibizan holiday home for friends or families which enjoys a glorious countryside location high in the hills near San Jose, and incredible sea and sunset views. 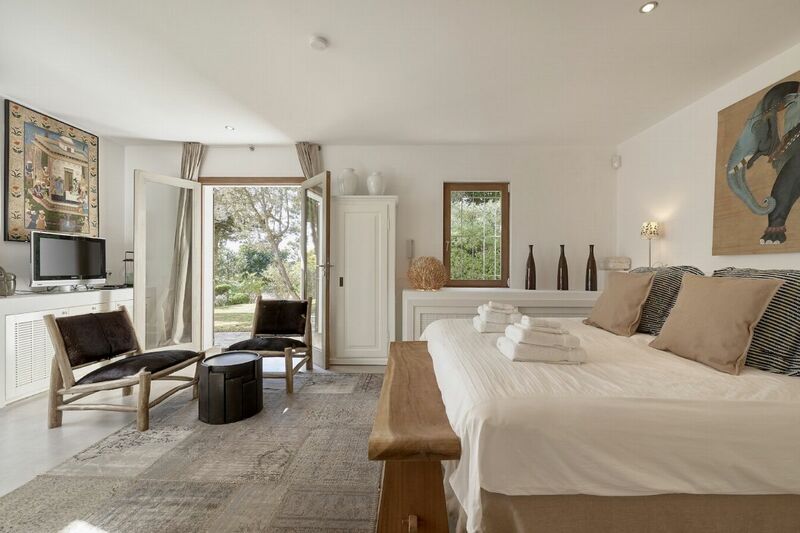 The master bedroom has a double bed, safe, and two en-suite bathrooms, one with a walk-in shower and the other with both a bath and shower. 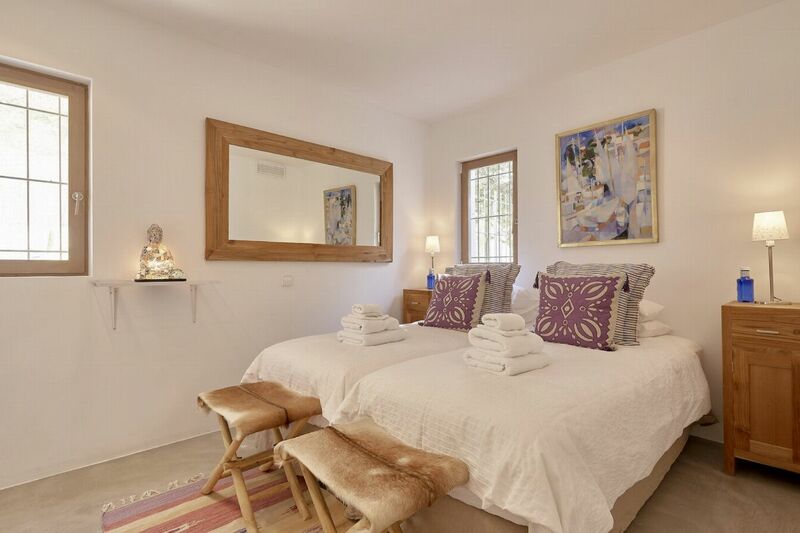 Closest to the master bedroom and ideal for young children; it has a twin beds and access to a bathroom with a shower just across the corridor. 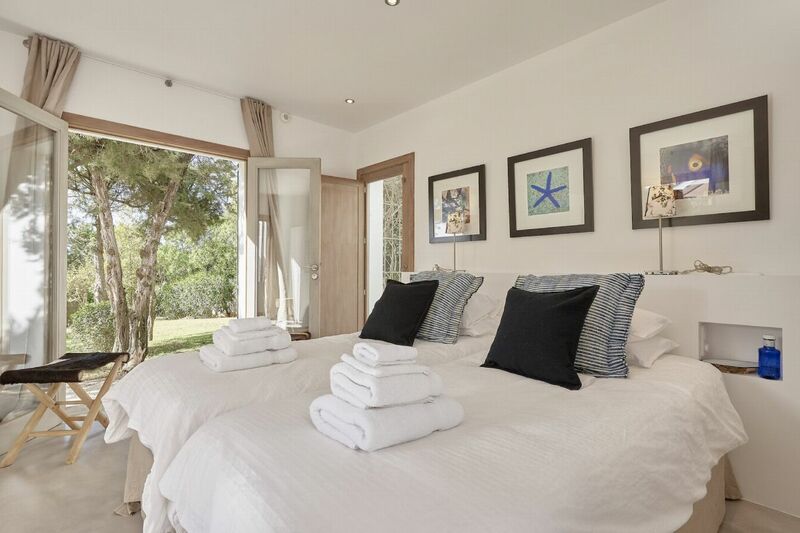 Double bed and looks out over the lower grounds; thereâ€™s an in-room shower and sink, and the WC is across the corridor and shared with Bedroom 4. 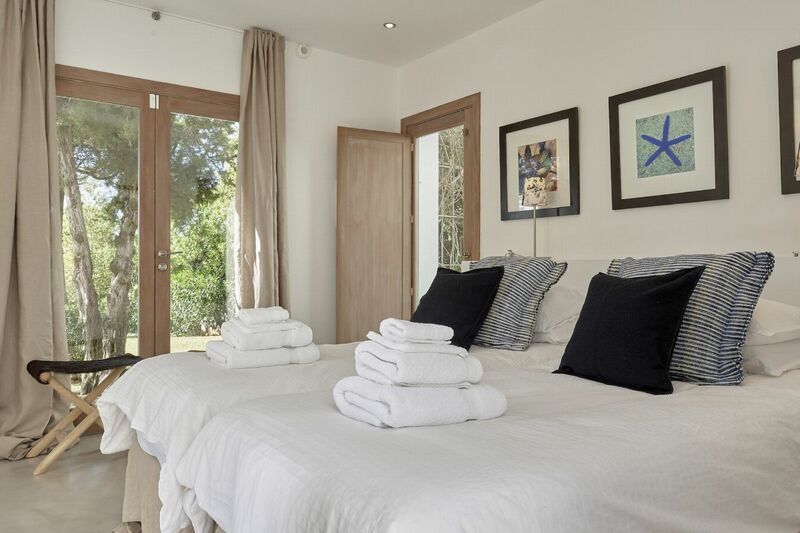 Double bed and direct access to the lower terrace; thereâ€™s an in-room shower and sink, and the WC is across the corridor and shared with Bedroom 3. 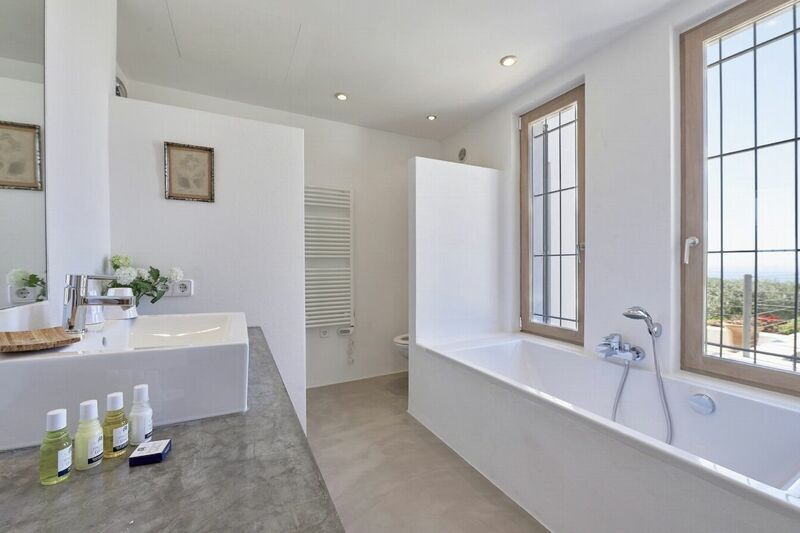 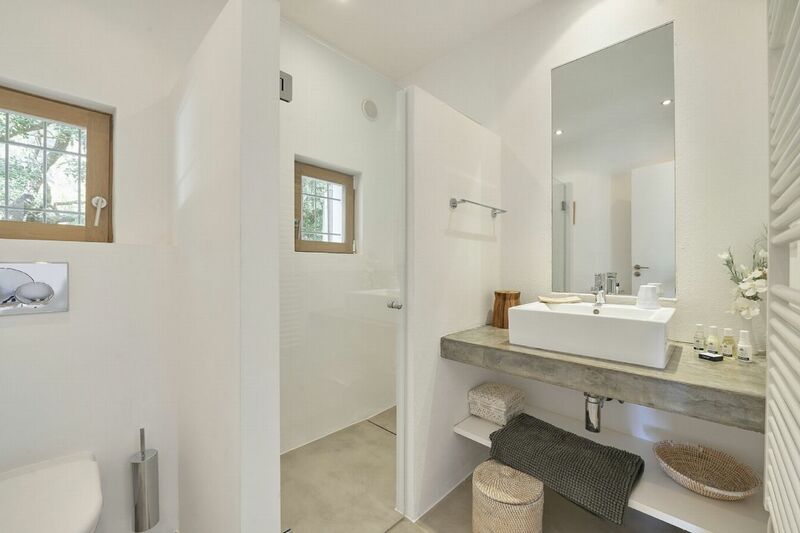 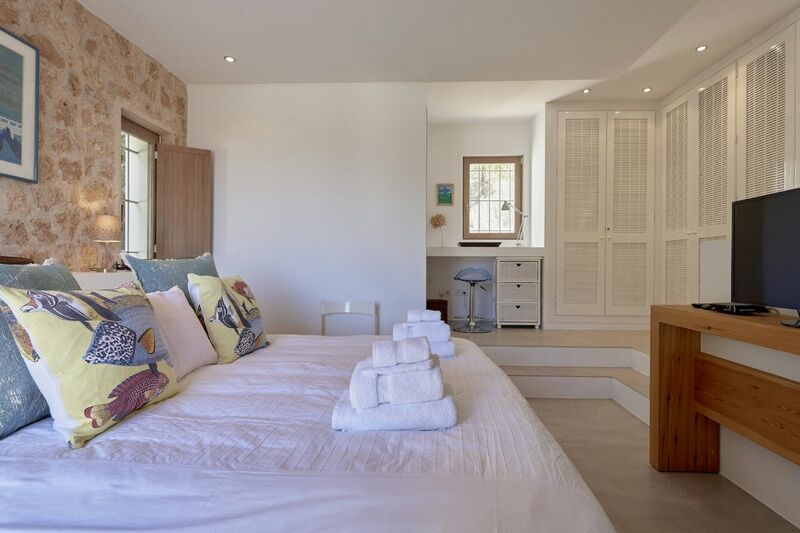 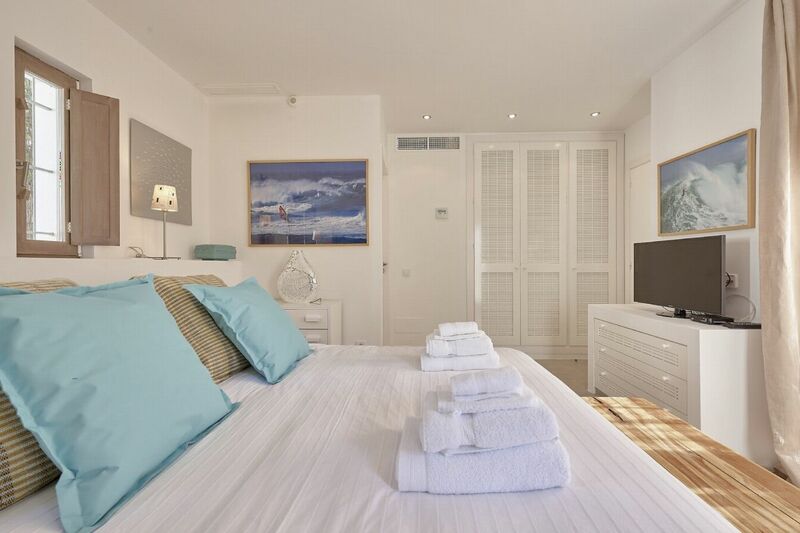 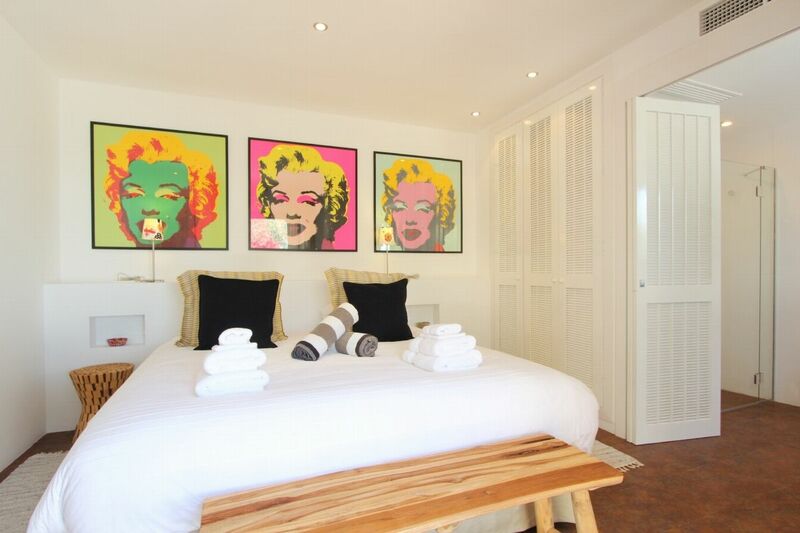 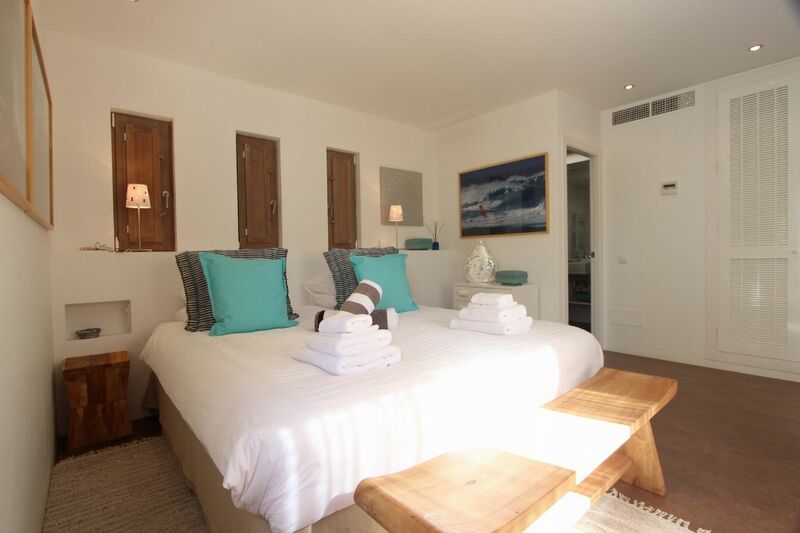 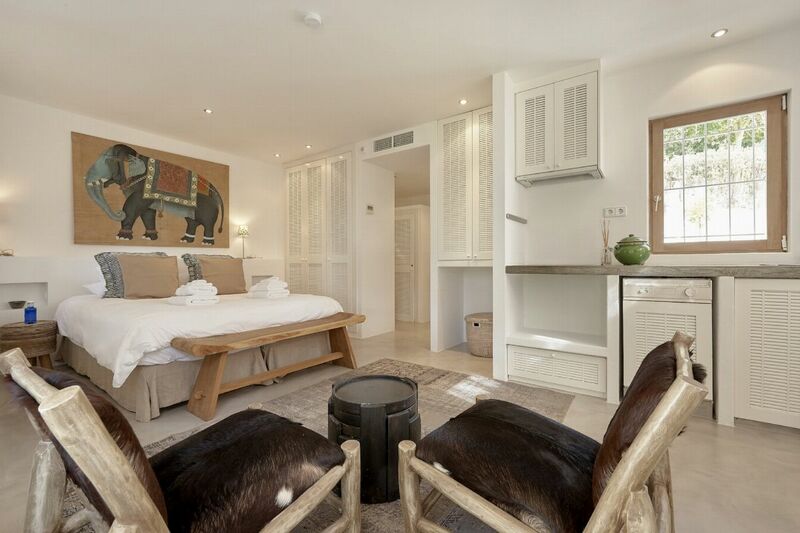 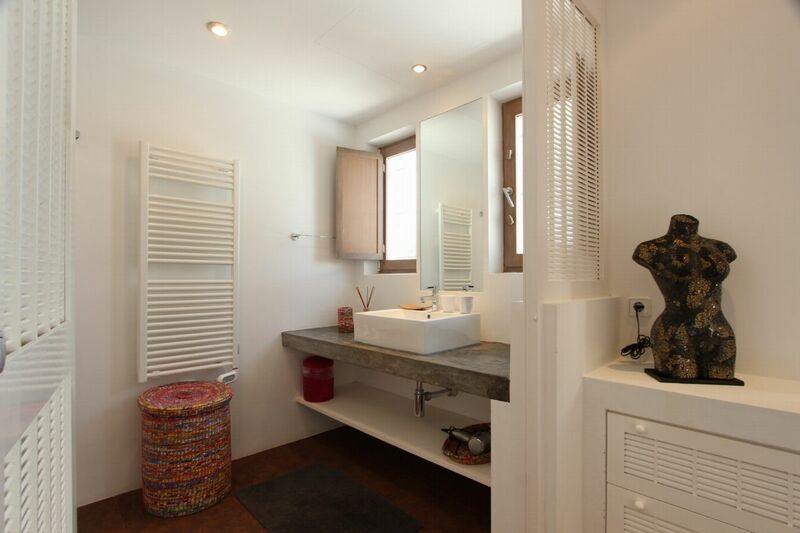 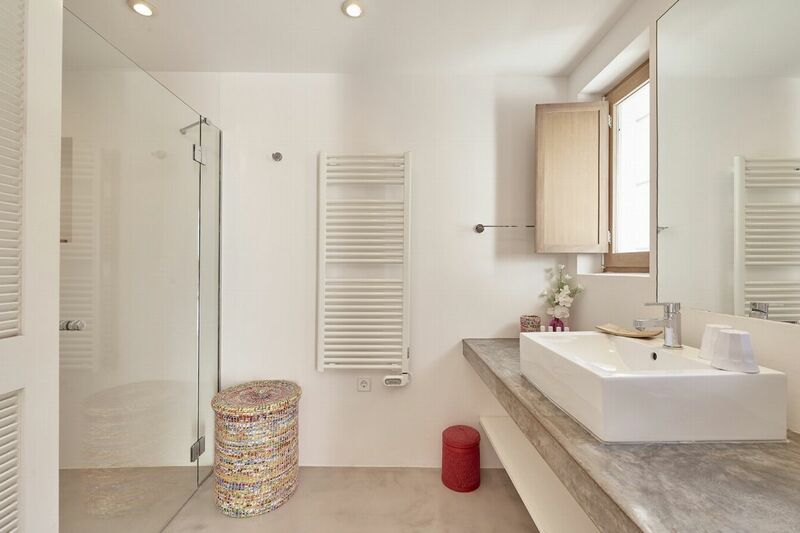 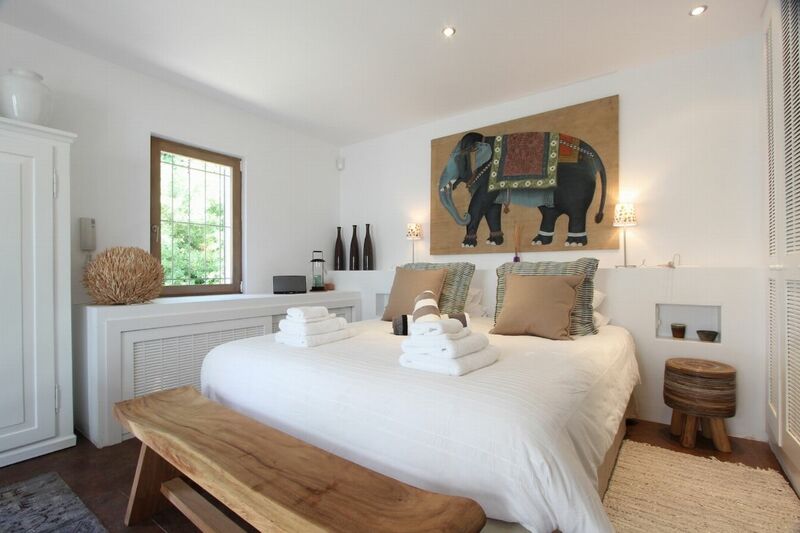 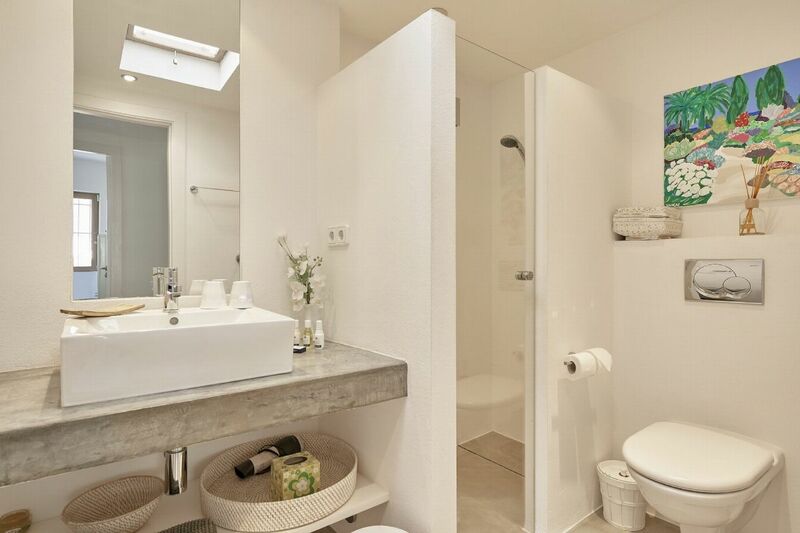 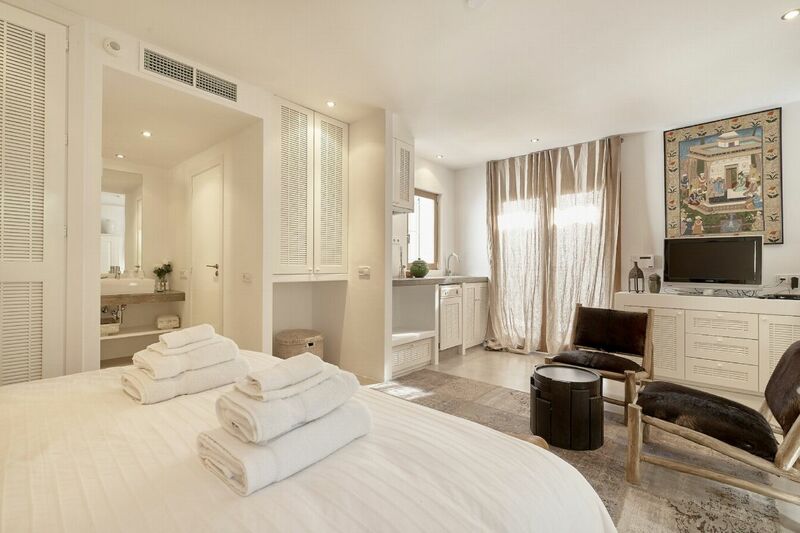 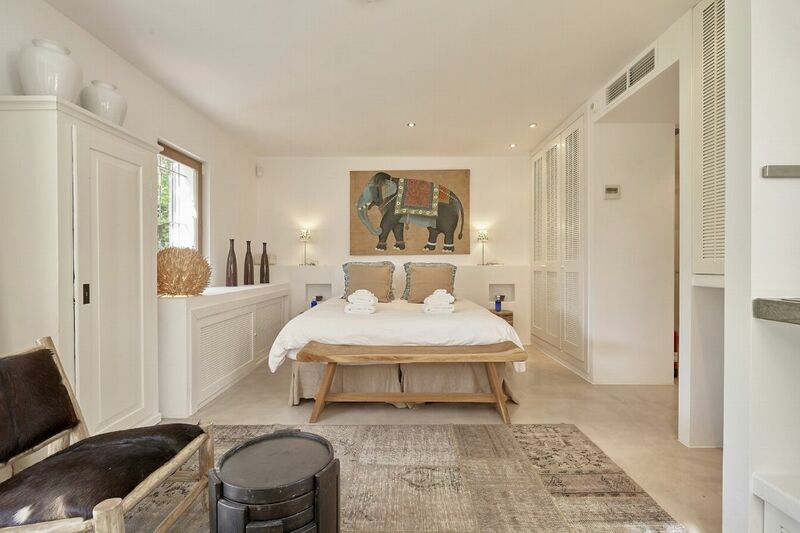 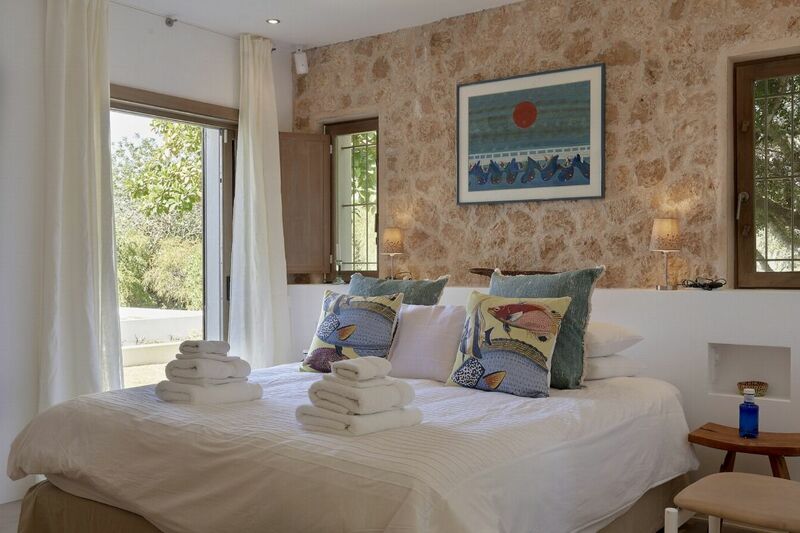 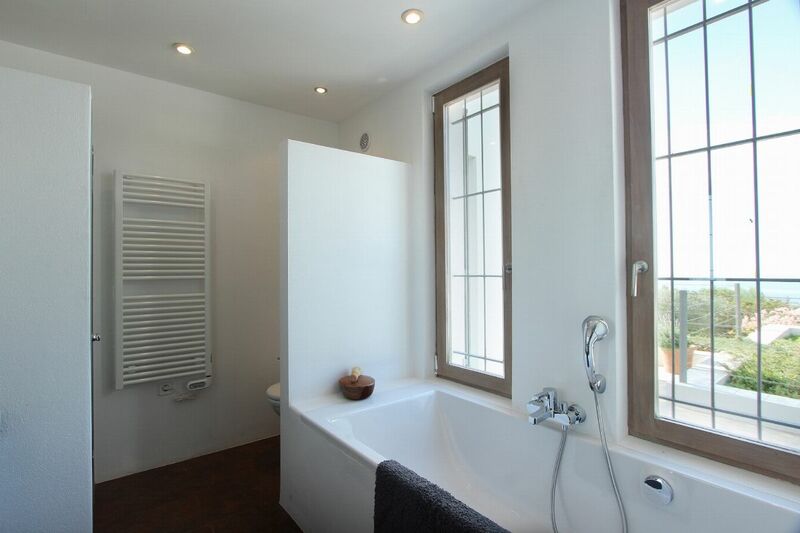 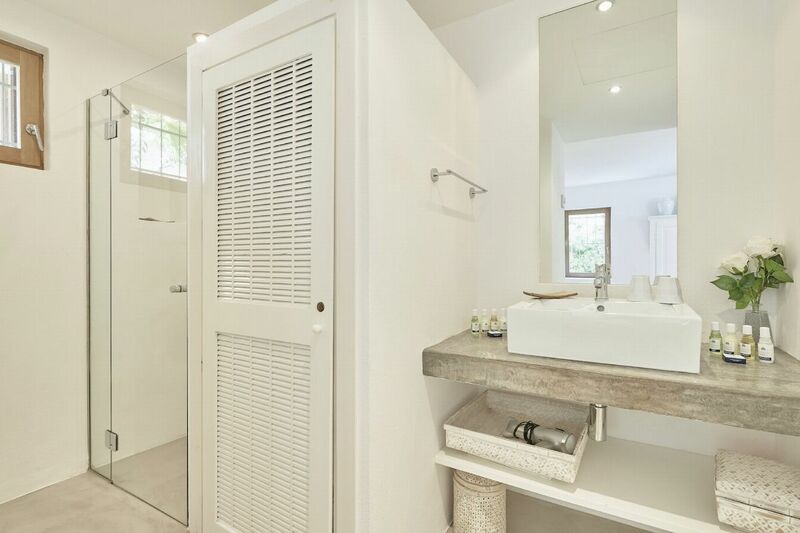 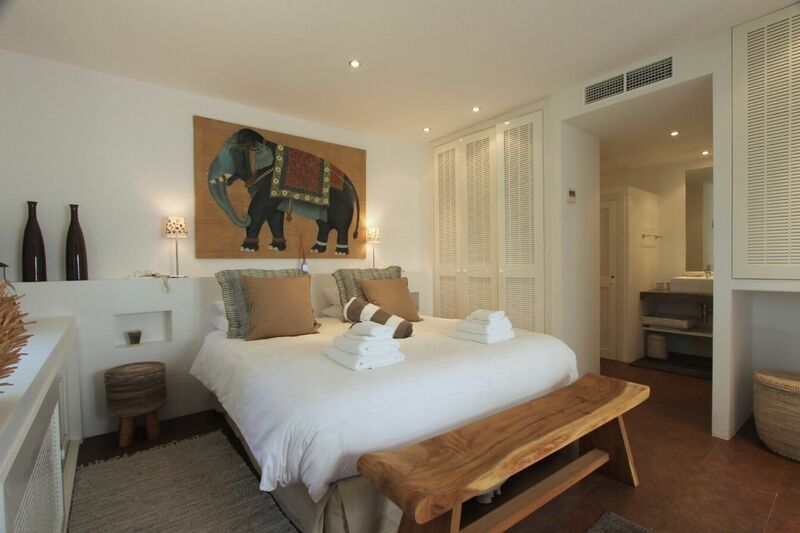 Separate building set on the lower terrace; this room has twin beds and an en-suite bathroom with a walk-in shower. 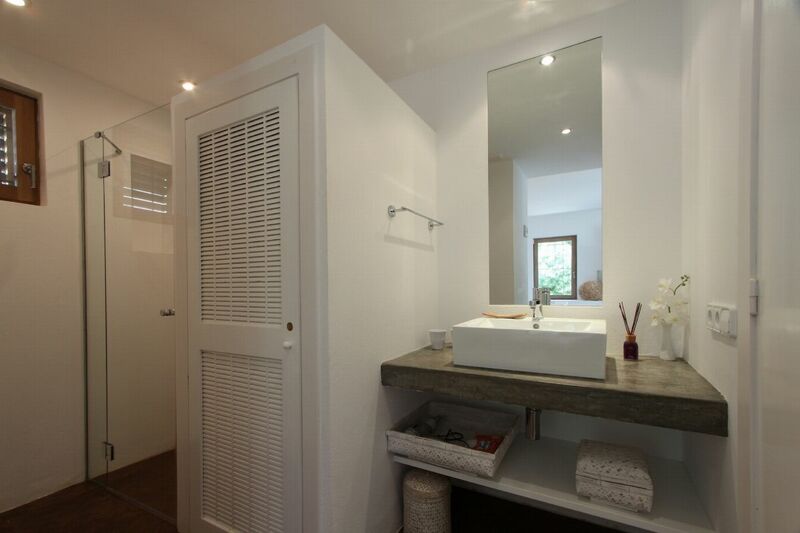 Separate access. 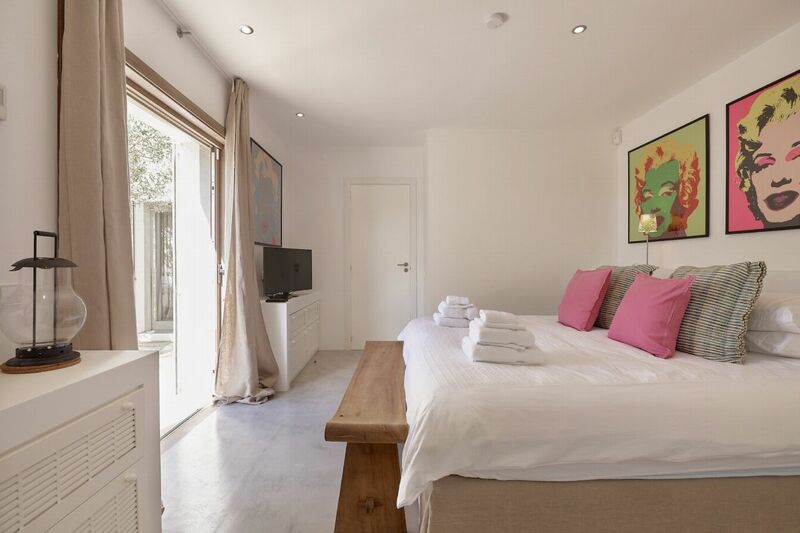 A studio room in the lower courtyard; thereâ€™s a small kitchenette area with an electric hob and fridge, a double bed and an en-suite bathroom with a walk-in shower. 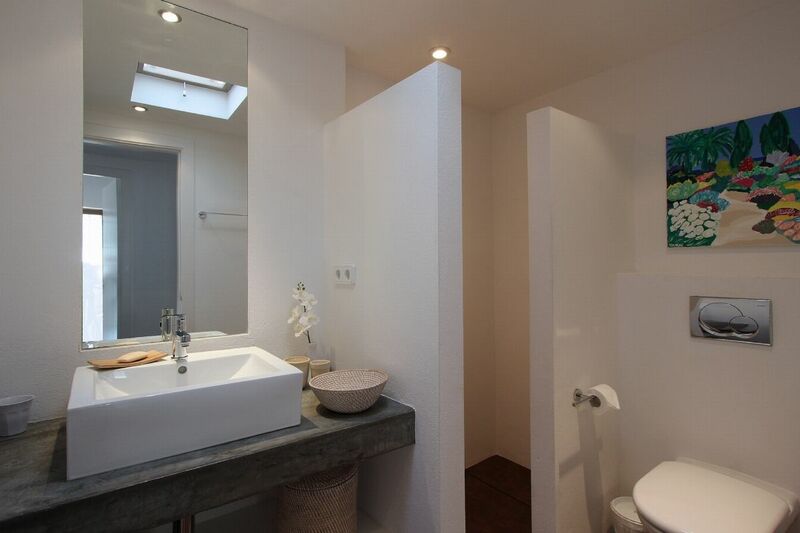 Separate access.